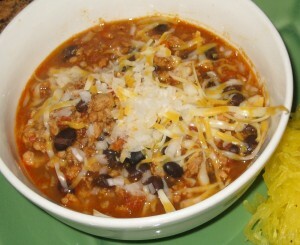 Turkey Chili is new to my repertoire this year, but it has been extremely well received by both family and guests. I like that this one serves equally well as leftovers both in taste and presentation. Plus the bonus of it being a one pan, one dish meal. Chili, like tortilla soup, seems to be a dish that means different things to different people. I started to enter a contest earlier this year where part of the instructions required a smooth consistency of meat to gravy, containing no identifiable vegetables at all. And some people think of chili only being a dish served so spicy it demands several beers in rapid succession to keep your taste buds from being destroyed. This turkey chili with black beans recipe is not very spicy – you can adjust the amounts of cayenne and chili powder to increase the intensity to your desire. You also could add half of a minced jalapeno in with the garlic, similar to the method I use in my tortilla soup. I prefer to spice mine at serving with a sprinkling of red pepper flakes. Enjoy experimenting! Heat a heavy bottomed stock pot on medium heat. Add olive oil and saute onion and bell pepper 8 minutes. Add ground turkey, increase heat to high and brown thoroughly. Add garlic, cook another minute. Add tomatoes, spices and stock, bring to a boil, then reduce heat to low and simmer for 2 hours. Add black beans, simmer another 30 minutes. Serve and enjoy!